My kids are STILL obsessed with Fortnite. Honestly, I don’t get it. I tried to play it with them once and I had no idea what was going on. They, however, love it. 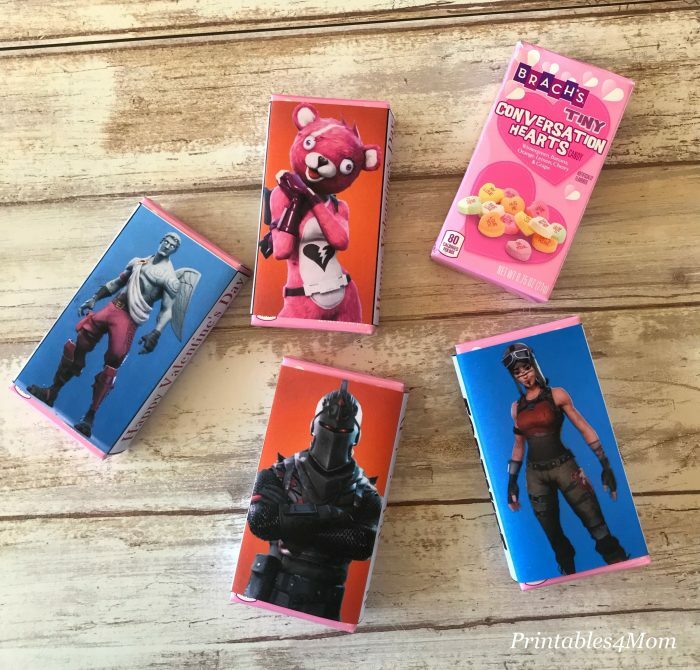 So of course, I wasn’t surprised when my youngest son requested Fortnite Valentine’s this year. 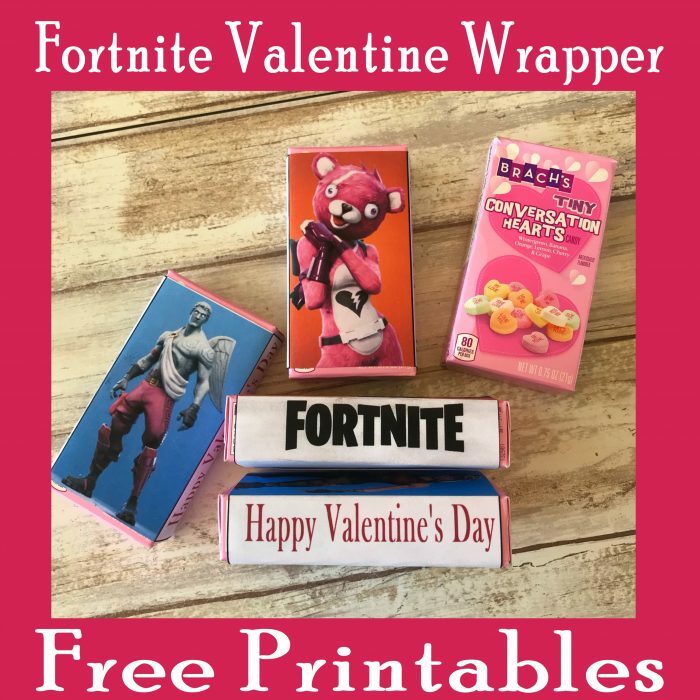 Grab the free Fortnite Valentine’s Day Printable Candy Wrappers to recreate these Valentine’s for your little Fortnite fans! 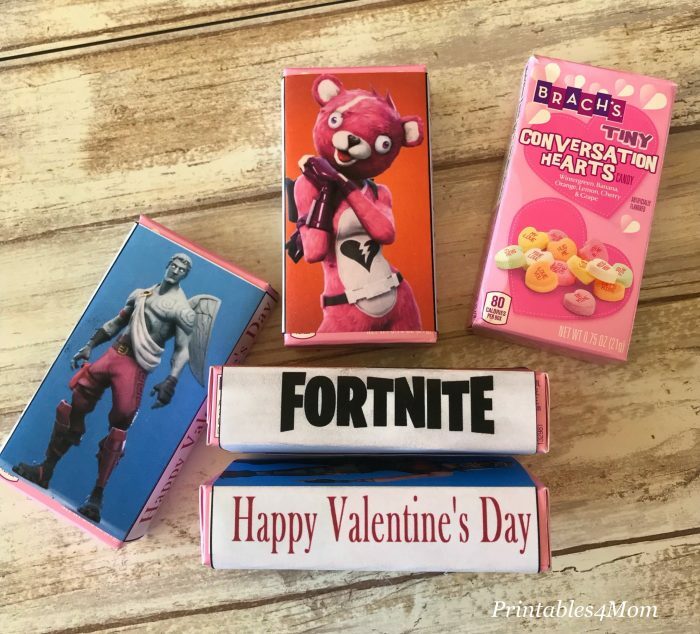 We found a bunch of Brach’s Tiny Conversation Hearts at Walmart and my son asked if I could use them to make Fortnite Valentine’s for him. He loves them and can’t wait to hand them out to his classmates this year! These Valentine’s feature Black Knight, Love Ranger, Cuddle Team Leader and Renegade Raider. 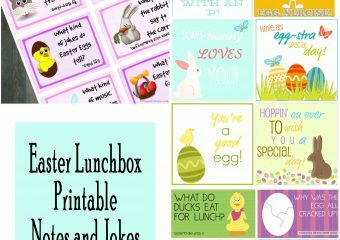 We used regular printer paper and found packs of 5 Brack’s Tiny Conversation Hearts for $1 at Walmart. Grab the printable below to make your own Fortnite Valentine’s. After cutting out each wrapper, fold them the conversation hearts box and secure in the back with glue or tape. There is room on the back to sign your name or address your Valentine’s as well.